Kitchen Window: Celebrating The Pies Of March When you think of food-focused holidays in March, St. Patrick's Day may leap to mind. But before you start counting clover leaves, there's some other math to do. Pi Day, celebrated on March 14, pays homage to the mathematics of a circle with, of course, pie. Get recipes for Sweet Potato Pie (clockwise from right), Pizza Pie, Granola Cranberry Walnut Pie, and Pimp My Mince Pie. I choose to believe that Pi Day is just overshadowed by St. Patrick's Day. I mean, come on — if you can count clover leaves, you can slice up a pie without any problem. Yes, pie — if not pi — really is easy. It's March, and you know what that means. No, I'm not talking about March Madness. I'm not referring to Mardi Gras. I don't even mean St. Patrick's Day — so I won't be sharing recipes for Irish soda bread or scones, or tips on how to get beer just the right color of green. I am, however, talking about a different celebration involving food. 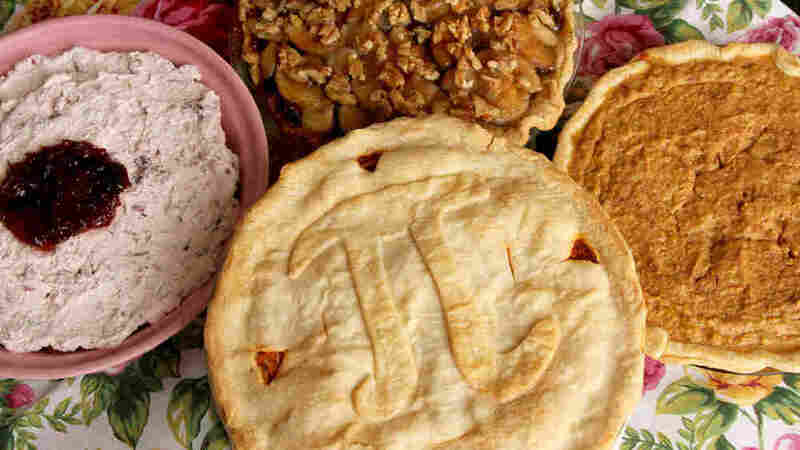 Get ready to roll out some dough, because it's almost Pi Day. Yes, I've spelled it right — think back to geometry class. Pi represents the ratio of a circle's circumference (the distance around the circle) to its diameter (the distance across it). It's been represented by the 16th letter in the Greek alphabet since the 1700s. For the math challenged, think of something that's round. Might I suggest pie? It's the perfect example because, in addition to being round (and popular — pie is the new cupcake, after all), it's pronounced the same way as pi. Now, it's been a long time since I sat in math class and learned about pi. I do remember that everyone in the class, including the smart kids, had a snicker when the teacher introduced the word. "Mmmm ... pie," we all said aloud and in unison. Mind you, this was pre-Homer Simpson and his infamous utterances. If only we had thought of it then, we could have had pie at our own Pi Day party. Here's what I know about pi: Its value is about 3.14159265. It's often shortened further to 3.14, but it actually goes on forever. And, like the Prince song says, "Forever is a mighty long time." I also know there are equations that use pi to calculate the area of a circle. How you do it, I have no idea. For more than 20 years, Doreen McCallister has been keeping her NPR colleagues guessing about what's in her baked goods. Recipes like Tomato Soup Cake, Mayonnaise Cake and Velveeta Fudge piqued her interest, and she started experimenting with her own secret-ingredient recipes. Even when she brings something "normal" to work, everyone demands to know: "What's in it? No, really — what's in it?" Judging from my math grade, that's all I knew back then, too. Apparently I'm a child left behind, and I'm OK with that. What I'm not OK with is that back in the day, I didn't capitalize on the nonmath part of pi. I didn't take the number 3.14 and think outside the circle. Some genius grasped the idea before I did and started Pi Day — which, of course, is celebrated with pie. But when to celebrate it? Well, the number 3.14, in terms of the calendar, translates to the third month and the 14th day — so, March 14. It's been further suggested that 1:59 is the perfect time to celebrate, reflecting a few more places after the decimal. I might not be able to calculate the area of a circle, but I sure as heck should have been able to figure out the right date and time to celebrate Pi Day. Businesses that promote math, science and technology offer promotional Pi Day discounts. 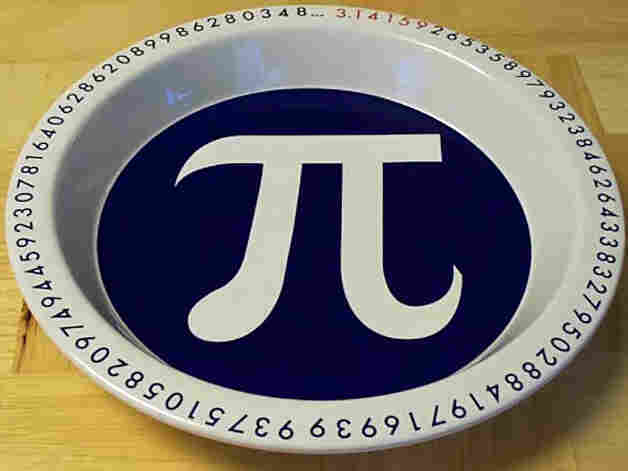 You can buy pi pie plates and clever pi T-shirts. With all of those marketers on board, it's just a matter of time before we all — not just math enthusiasts — celebrate the day. I choose to believe that Pi Day is just overshadowed by St. Patrick's Day. I mean, come on — if you can count clover leaves, you can slice up a pie without any problem. Yes, pie — if not pi — really is easy. I'm still a little bummed that I didn't come up with Pi Day. But just like the great mathematicians, I am pressing on. I'm searching for undiscovered territory when it comes to math- and science-related culinary holidays. When that cold fusion debate is settled, I'll celebrate with gazpacho and other foods that are eaten cold but that, when you first try them, really seem like they should be cooked. Take steak tartar, for another example. In the event that string theory becomes law, I'm prepared with dozens of recipes that use string cheese or string licorice. As for which date those events will be celebrated on, we'll just have to wait to find out. Until then, I'll keep marking Pi Day with some old favorites — and my new creation that elevates mincemeat pie to the 10th power. 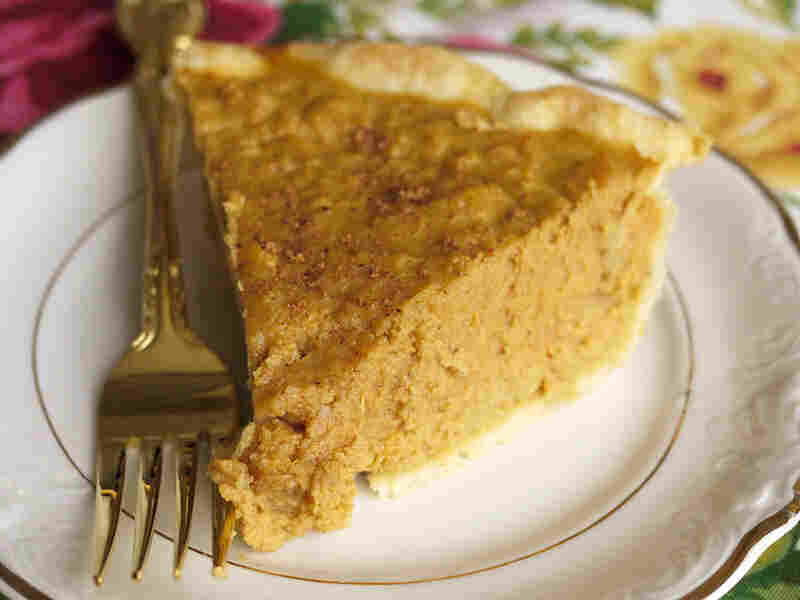 I had never eaten sweet potato pie, let alone made it, when a work colleague asked me to make one. The woman was insistent that I could make a good sweet potato pie. "Alright," I told her, "give me a week." One thing I learned through trial and error is that while pumpkin and sweet potato pies may look similar, they are very different. I went into the experiment thinking pumpkin pie would be my favorite of the two. Now, I'm not so sure. Coat a 9-inch pie pan with nonstick cooking spray and place rolled-out dough in pan, crimping the edges and pricking the bottom with a fork. Drain and mash yams. Mix in margarine, eggs, sugar, cinnamon and nutmeg. Then add evaporated milk and vanilla. Pour mixture into shell. Sprinkle with pecans if desired. Sprinkle top with cinnamon and nutmeg. Bake for 45 to 55 minutes. It's done when it no longer jiggles. Tired of regular pizza? This pie recipe is a chance to switch things up a bit. Use any ingredients you like; switch out the meat ingredients, if you prefer vegetables. Coat a 9-inch pie pan with nonstick cooking spray and place rolled-out dough in pan, pricking the bottom with a fork. 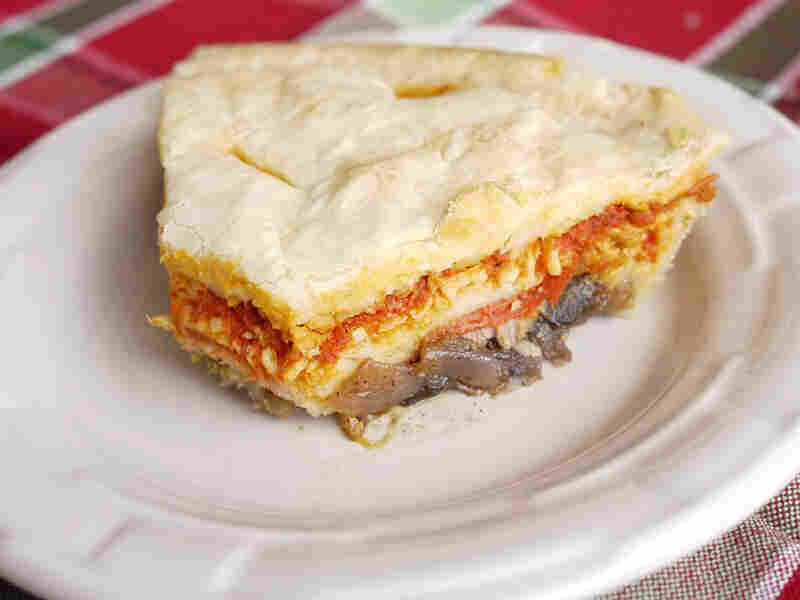 Begin adding sausage, mushrooms, onions, pepperoni, Canadian bacon, peppers and mozzarella cheese. Pour the sauce over the top, then sprinkle on the parmesan cheese. Place the second rolled-out crust onto the top of the pie, crimp the edges of the two crusts together, and cut some small vent holes in the top. Bake for 15 minutes at 400 degrees. Lower oven temperature to 375 and bake for another 30 minutes. Let rest for about 5 minutes before serving. 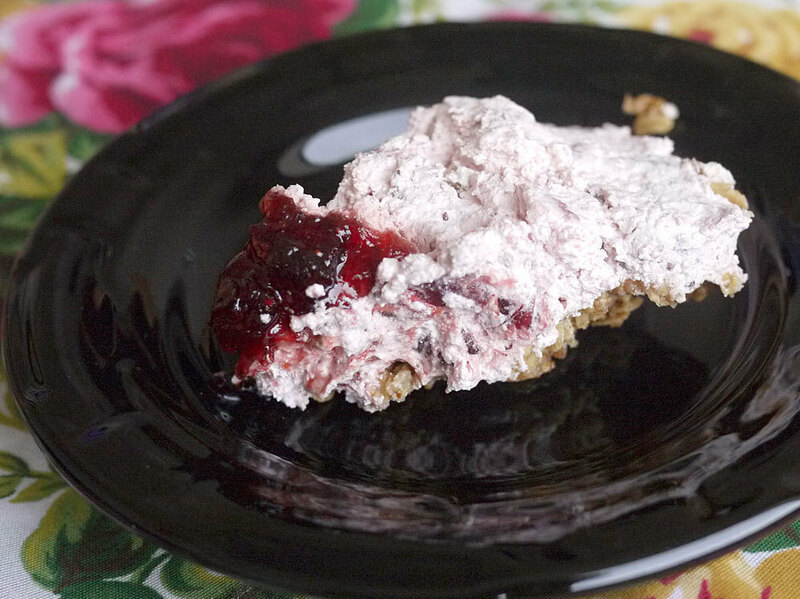 This pie can be made lickety-split. It's perfect for after a heavy meal because it tastes lighter than a lot of berry pies (though it's not light calorically). Don't have time to make the granola crust? Use a store-bought graham-cracker crust. It's not as tasty but will do the trick. Combine granola and melted butter in a small bowl. Coat a 9-inch pie pan with nonstick spray, then press the granola mixture into the pan. Bake the crust for about 7 minutes at 350. Let cool for 15 minutes. In a separate bowl, gently combine the cranberry sauce and whipped topping. Spoon the mixture onto the crust, then sprinkle on the walnuts. Refrigerate for at least two hours. Before serving, garnish the pie with 1 to 2 tablespoons of fruit preserves (or more to taste). Long after the December and New Year's holidays are over, I usually remember that I have forgotten to make mince pie. Apparently I'm the only one who notices. An unscientific poll of my co-workers indicates that most of them don't like mince pie. I set out to remedy that, borrowing an idea from the MTV show Pimp My Ride. (If you haven't seen the show, they take a car that's in poor condition and restore it and customize it.) One suggestion: Don't tell people it's mince pie, and they will love it. Coat a 9-inch pie pan with nonstick cooking spray and place rolled-out dough in the pan, crimping the edges and pricking the bottom with a fork. Beat eggs, sugar, syrup, melted butter and salt. Stir in pecans, and pour into pie shell. Remove from oven and spread a layer of mincemeat pie filling on top of pecan layer. Spoon apple pie filling onto mince layer and spread evenly. 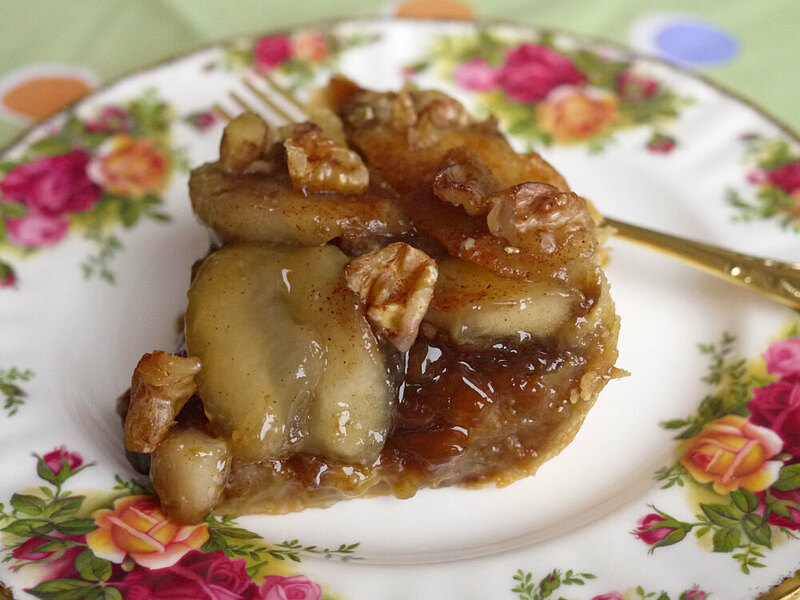 Break up walnuts and sprinkle on top of apple layer.